It’s been just over a week now since I received my Creality CR10S-Pro and, perhaps inevitably, I’ve hit my first real snag. This morning halfway through the first layer of a print there came the horrible sound of a printer in distress and by the time I could hit the power button the nozzle had buried itself into the print bed. The brass lead-screw guide on one side was flapping around in the breeze. A (fairly) thorough search of the area revealed no random unclaimed screws on the floor or desk so I can only assume this part was never screwed into place. Regrettably, none of my unboxing photos have a clear shot of this side of the frame, all I have is this shot where the area in question is out of focus (not, for once, because of my poor camera work but because it’s in the background). 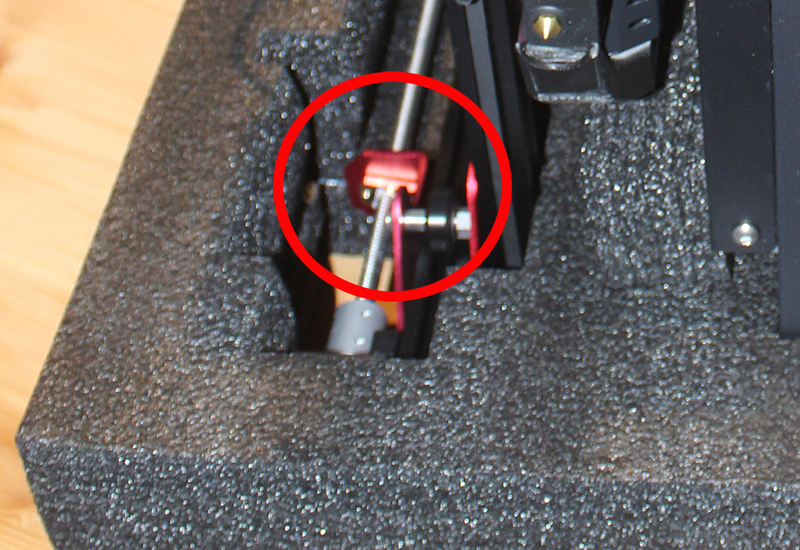 It’s really not possible to see if there are any screws in place, especially as I don’t know how far, if at all, they should protrude beyond the bottom of the guide, but to my eyes that brass piece doesn’t look parallel to the mounting plate, which it would have to be if both screws were in place and tight. A check of the other side revealed that while this had both screws in place, they were loose so the z-axis was held in place virtually by its fingernails. It’s really rather annoying that I don’t know the state of either of these guides upon first build. 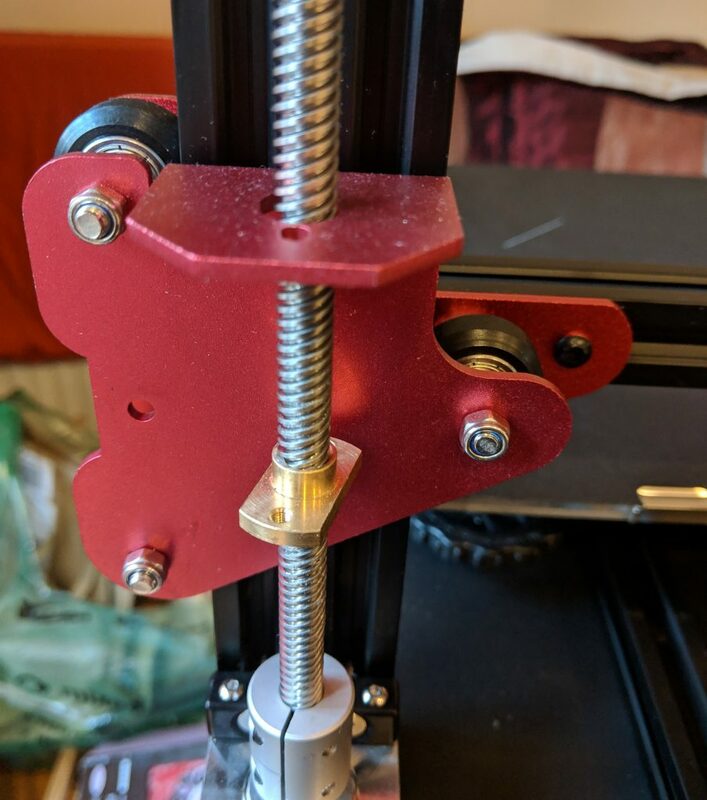 IF this loose fitting/missing screws was the cause of the z-axis crash (and it seems an incredible coincidence if it wasn’t), then it seems odd that the first test print and about half-a-dozen subsequent prints have all been fine. More worrying is that the second layer of my reprint following my repairs (luckily I had some spare screws to fix the unattached guide in place) and recalibration is still looking a little “wavy” whereas previous prints had all been perfect. The residue on the x-axis rollers looks like it might be rubber “dust” from where the rollers are wearing on the metal cross-piece. Hopefully this will be a one-off because they’re new and not continual wear because there was a relatively substantial build-up and if that’s just a week or so of printing these rollers will have worn away in a few months. I’ll continue to look for why the layers seem inconsistent now but if you’re considering a CR10S-Pro please do check ALL the screws and fittings you can see and make sure everything is tight that should be tight and nothing seems unattached! The Creality CR10S – Pro has come along at a perfect time for me. 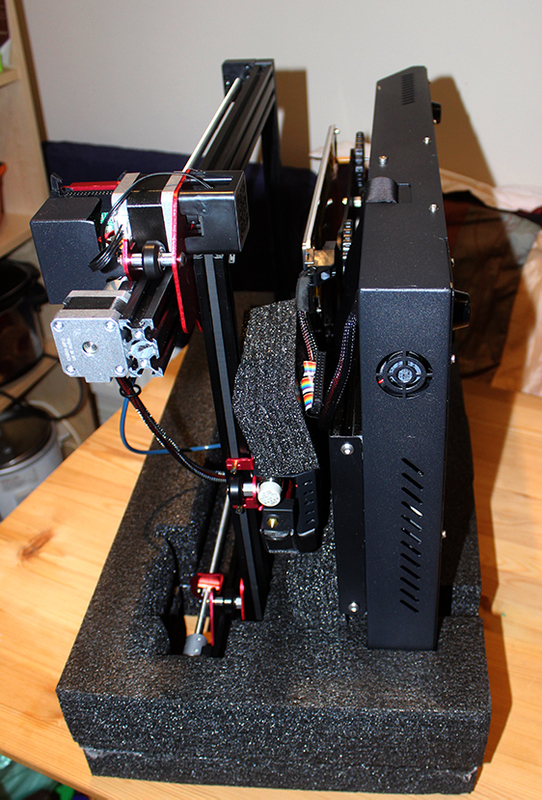 I’ve been looking for an additional FDM printer for some time and had been attracted by the the “standard” CR10-S because of its 300mm square bed, having a number of clients needing fairly large prints. I’d been put off by its separate control box, lack of auto-levelling but was on the verge of buying anyway when I heard about the Pro version. I’ve been waiting for it to become available here in the UK and I pounced yesterday when it appeared on Amazon and this afternoon it arrived. The box on the kitchen table! 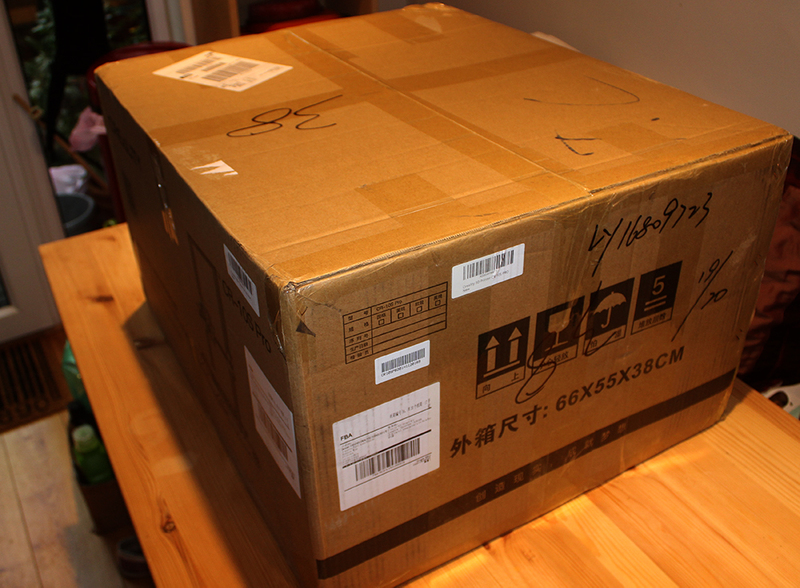 The box is as large as you’d expect for a printer of this size & type, though not especially heavy. It looks huge here sat on the kitchen table (the only place I had room to do the build! ), but a lot of that is the packaging. 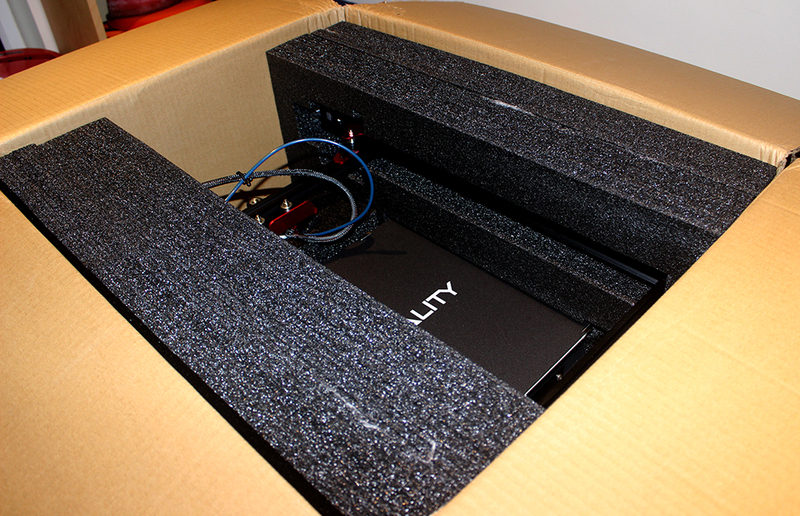 Opening the box reveals a vast empty space in the centre and the thick padding either side and to the top and bottom, with the two main printer parts comfortably held in the centre. There’s no way to remove anything individually from the box, you’ll have to lift the entire interior packaging and all from the box and onto your work surface and this will probably be a lot easier with a second pair of hands, although I did manage on my own. On one side of the packaging is the (very!) small reel of PLA filament (mine was a translucent white) and a box containing various tools, leads, screws and so on. Remove these and put them to one side. I found the easiest way to removing the printer parts from the packaging was to turn the whole thing on its side with the side that had contained the reel and the box facing downwards. The top half of the packaging then comes away fairly easily, you can remove the small piece of extra packing (seen above in the centre of the photo) and can ease first the upper frame (to the left of picture) out, placing it somewhere safe, then the base itself. Is this the start of a revolution in desktop printing?